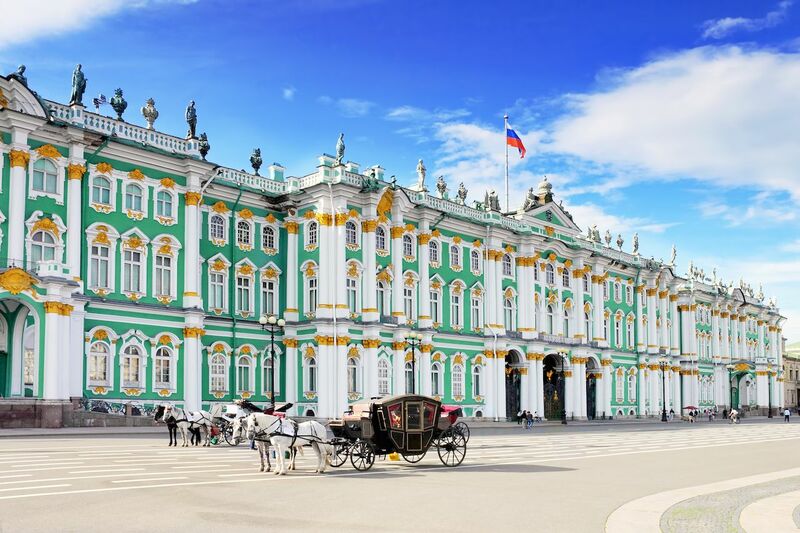 You may not live inside the walls of a sprawling royal complex, but at these gorgeous palaces in St. Petersburg, you can certainly pretend. Enter the prestigious doors and walk from room to room, dreaming of days gone by; these walls have seen a level of opulence many of us would find hard to fathom. Many palaces in St. Petersburg, Russia, are located just a bit outside of the town center, but fortunately, they’re easily accessible via super cheap public transport. Plan a trip to one or all of them; each palace has a distinct character, some have amazing gardens well worth exploring, and all are filled splendor that surpass even the most lavish castles of your childhood fairy tales. Located in the town of Pushkin, south of St. Petersburg proper, the Catherine Palace (known as the Great Palace of Tsarskoye Selo until 1910) is revered the world over for its majestic Russian Baroque architecture and over-the-top interiors, including the Amber Room, once considered to rank among the wonders of the world. The palace was commissioned by Catherine I, second wife of Peter the Great and eventual Empress of Russia, in 1717. Various bridges and pavilions adorn the property, adding to its beauty, including the famous and majestic Marble Bridge. 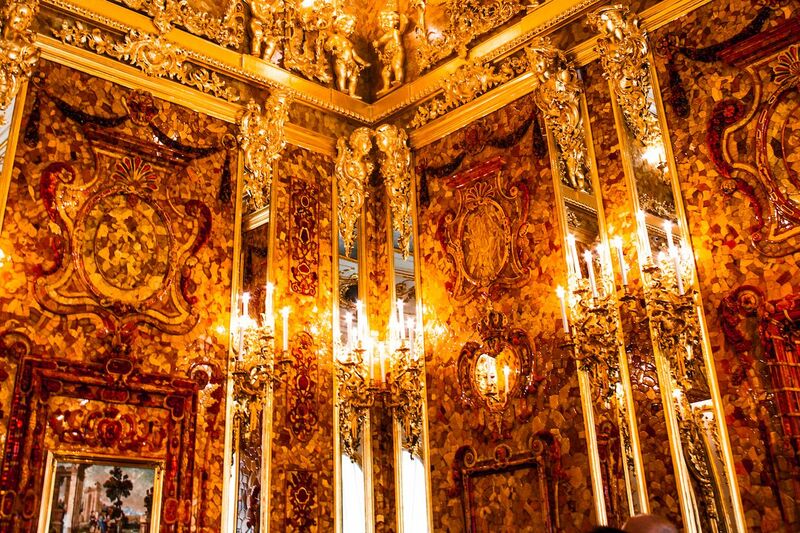 A rich golden-orange hue, the Amber Room (a gift to Peter the Great, ruler over Russia for over 40 years) was so named because it was encased in amber and gold and studded with jewels — and thus, unsurprisingly, fell victim to looting Nazis during World War II. A replica of the Amber Room was completed in 2003, but the original contents of the room are missing to this day. 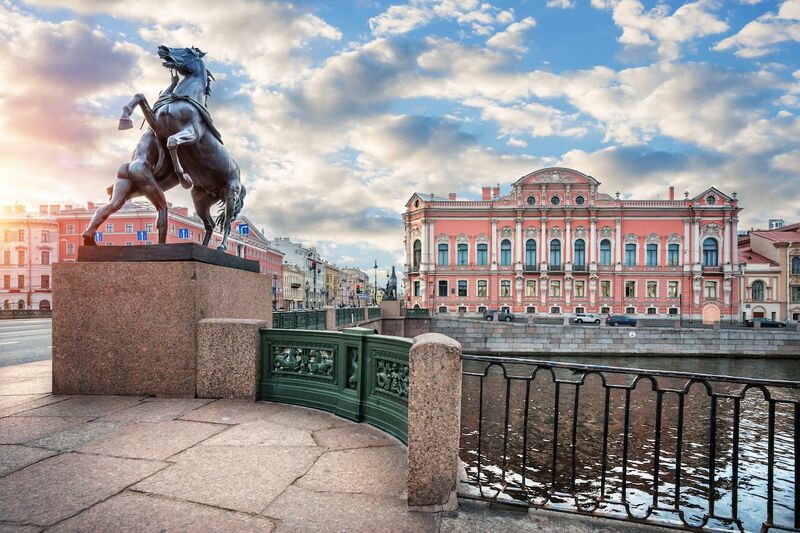 It takes less than an hour to get from the center of St. Petersburg to the palace — just hop on a train at the Vitebsky railway station and get off at the Tsarskoye Selo station. The Catherine Palace is open for tours daily. Now home to the world-class Hermitage Museum — the second-largest art museum in the world, after the Louvre in Paris — the Winter Palace was built as the official imperial residence for Russian royalty in the early 1700s and served in that capacity until 1917, when it became a museum following the Russian Revolution. Centrally located in St. Petersburg, it features 460 rooms spread across just three stories. 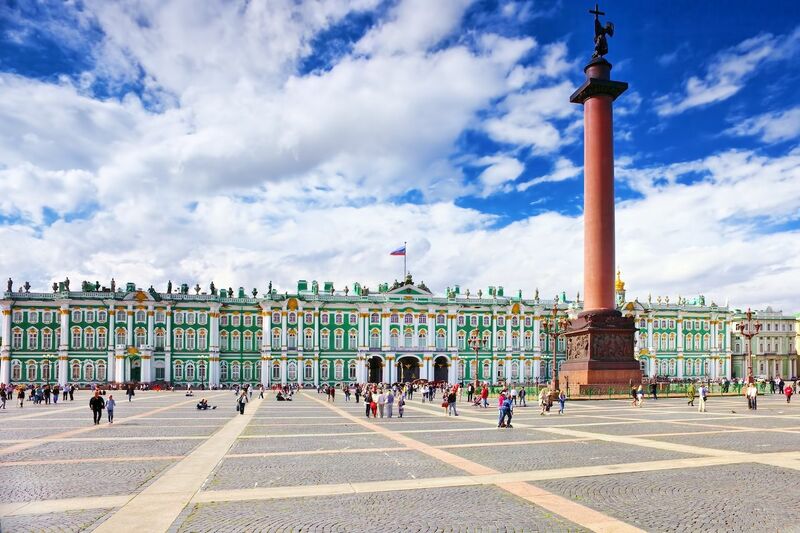 Outside the palace’s striking blue-green facade, Palace Square is the sprawling central square of St. Petersburg and contains the iconic Alexander Column, a monument to Russia’s victory over France and Napoleon. 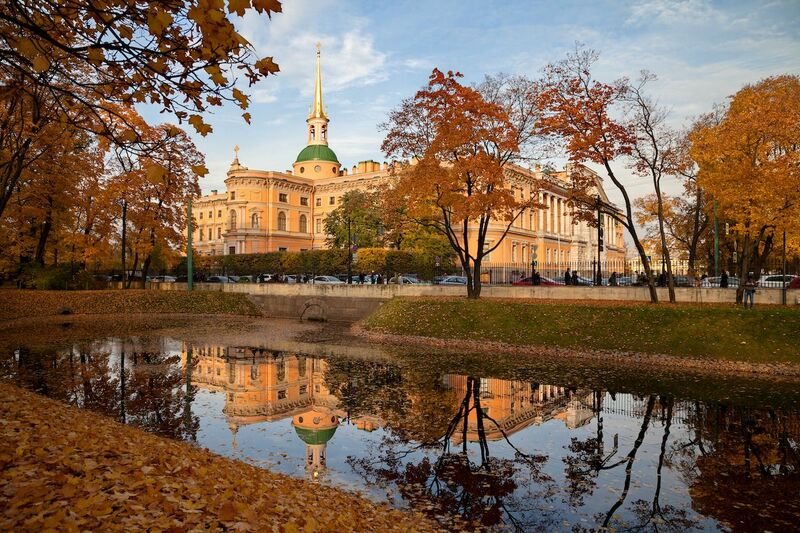 The Hermitage Museum is open for tours every day except Mondays and admission costs about $10 (700 rubles). Construction on Saint Michael’s Castle, a grand and architecturally diverse estate, began in 1797 and was intended for Emperor Paul I — however, mere weeks after moving into Saint Michael’s Castle, his worst fears came to pass and he was murdered in his own bedroom by members of his guard. The castle, which is located in the historic center of St. Petersburg, along the Fontanka River, has served as military housing, an engineering school, and now houses the main branch of the State Russian Museum. It’s open to visitors every day except Tuesdays. Admission is around $6 (400 rubles). 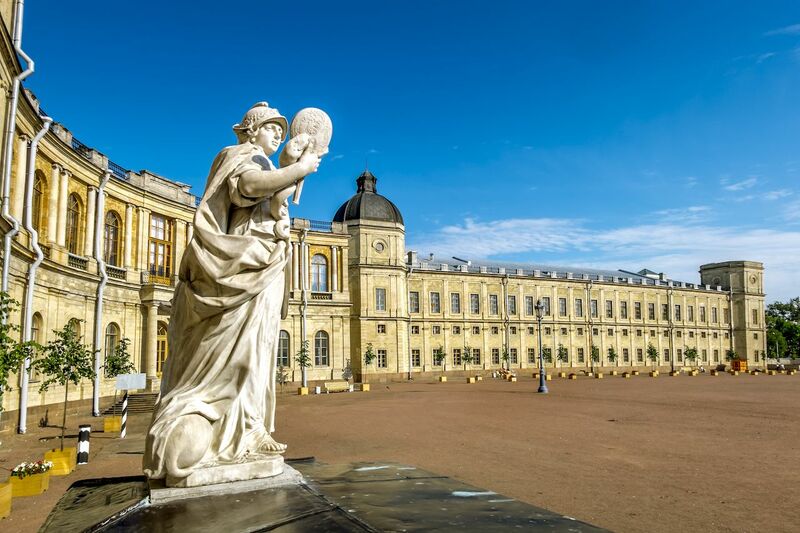 Located on the bank of the Gulf of Finland in Peterhof, a town west of St. Petersburg, Peterhof Palace and Gardens was Russia’s answer to France’s Palace of Versailles. 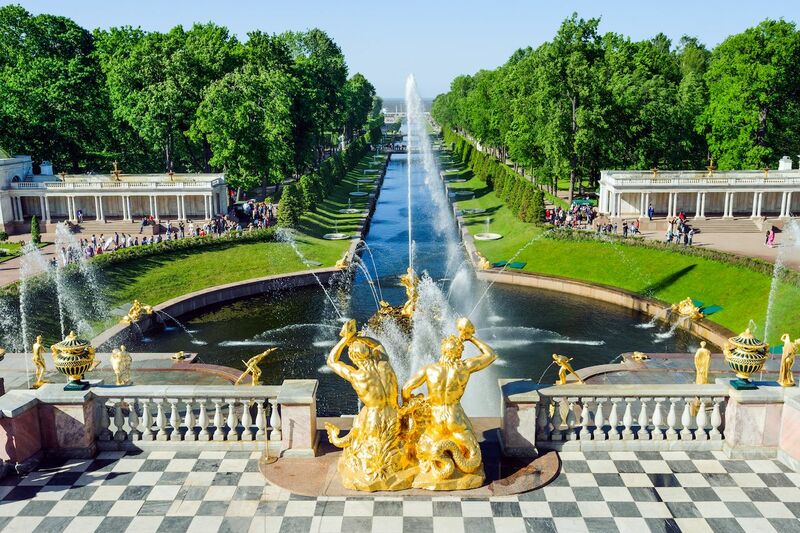 The palace was technologically advanced for its time; Peterhof’s innovative fountain system, created in 1720, allowed the 150 fountains of the palace complex to operate without the aid of pumps. Once a grand summer residence for emperors, Peterhof Palace and Gardens has since evolved into the Peterhof State Museum Reserve. The main facade of the palace stretches for almost 1,000 feet. On the grounds, visitors will find various fountains, gardens, labyrinths, and more. 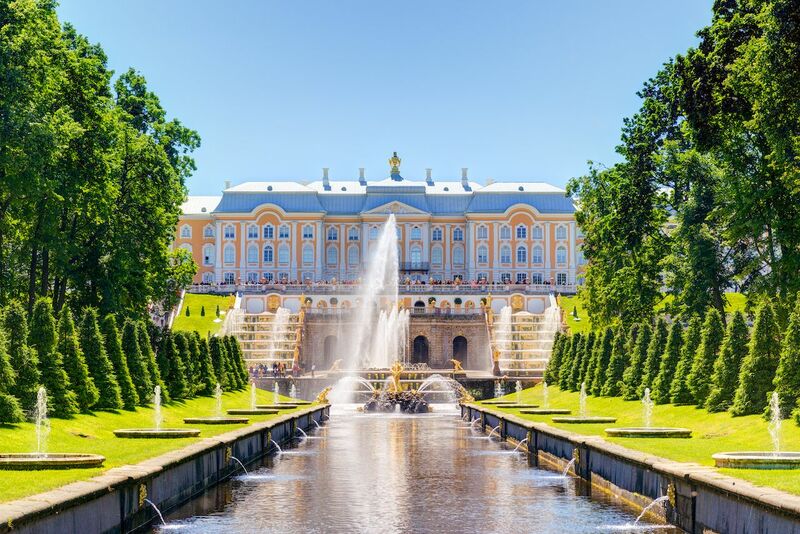 To reach the palace from St. Petersburg’s city center, hop on a train at the Baltiyskiy vokzal railway station to the New Peterhof stop — a 40-minute ride. The palace is open to visitors every day except Mondays and costs about $9 (600 rubles) to enter. The upper garden is open daily and offers free admission. Built in the mid-1800s, Beloselsky-Belozersky Palace became famous for the lavish parties once thrown in its many halls. 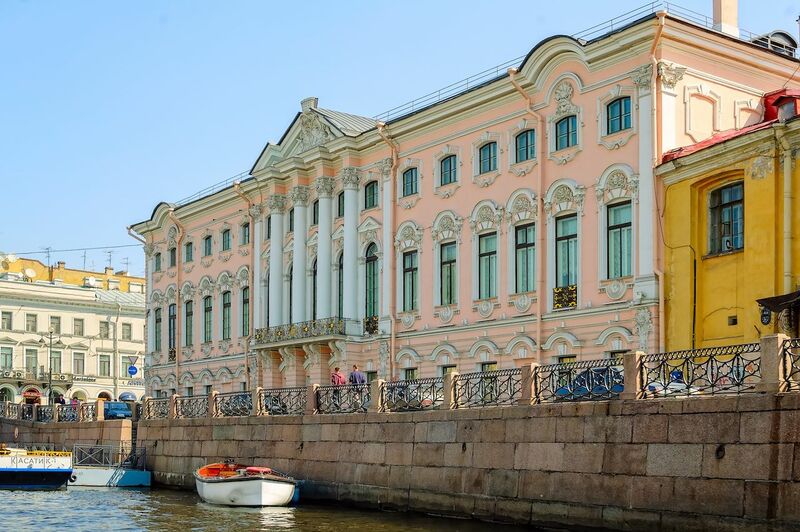 However, the upkeep soon became too much for the wealthy homeowner (the widowed princess and heiress Elena Pavlovna Beloselskaya-Belozerskaya) to maintain, so it was sold and restored — and painted a deep shade of pink as part of the facade restoration process in 1897. It later became headquarters for the Regional Committee of the Communist Party but, today, visitors flock to the site for its cultural center, concerts, and guided tours. 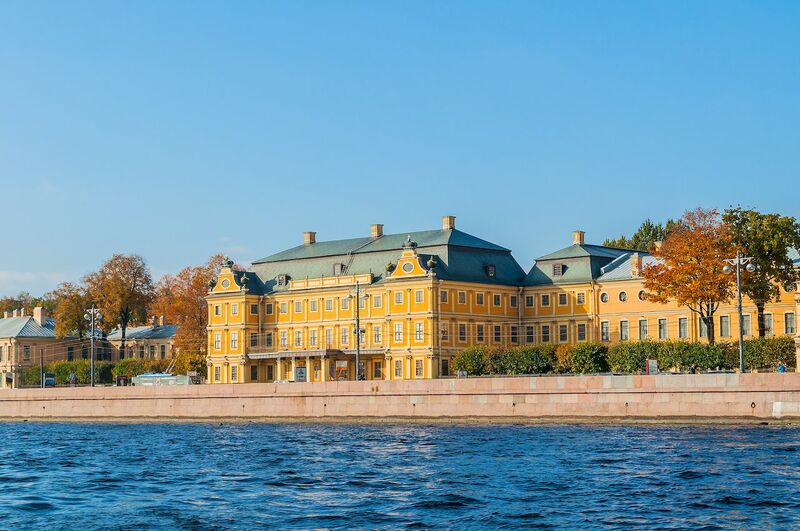 Tours of Beloselsky-Belozersky Palace, which is located along the Fontanka River and on Nevsky Prospekt, the main avenue of St. Petersburg, must be pre-arranged and cost bout $3 (200 rubles). Located on the Moika River in St. Petersburg proper and one of just two surviving residences of the extremely wealthy Yusupov family, Yusupov Palace was built by a French architect in 1776. However, it did not take on its current appearance until it was acquired by the Yusupov family in the 1830s, who then filled it with their massive art collection. 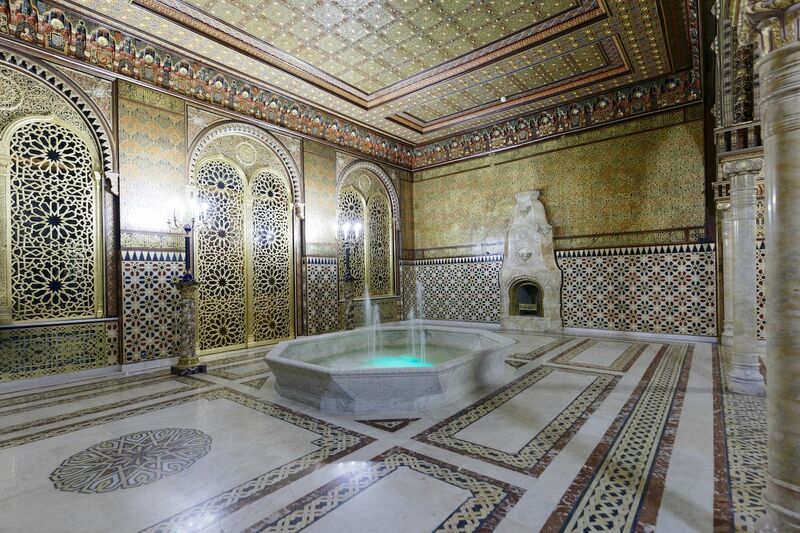 The palace’s lavish interiors feature an incredibly ornate theater, art galleries, parlors, state rooms, a Moorish lounge straight out of A Thousand and One Nights, and is open to visitors daily. Most notably, however, the palace is infamous to this day as the site of the murder of Grigori Rasputin, a Russian mystic and friend to the family of Tsar Nicholas II, the last monarch of Russia. The opulent interiors of Stroganov Palace in St. Petersburg are some of the most visually stunning in the world, with sprawling frescoes, brightly painted walls, elaborate decorations, paintings, and marble sculptures adding to the palace’s overall appeal. In fact, when Stroganov Palace was nationalized in 1918, it functioned as a museum of aristocratic life. The palace is now a branch of the Russian Museum, restored and preserved for future generations to enjoy. It is open to visitors every day except Tuesdays. 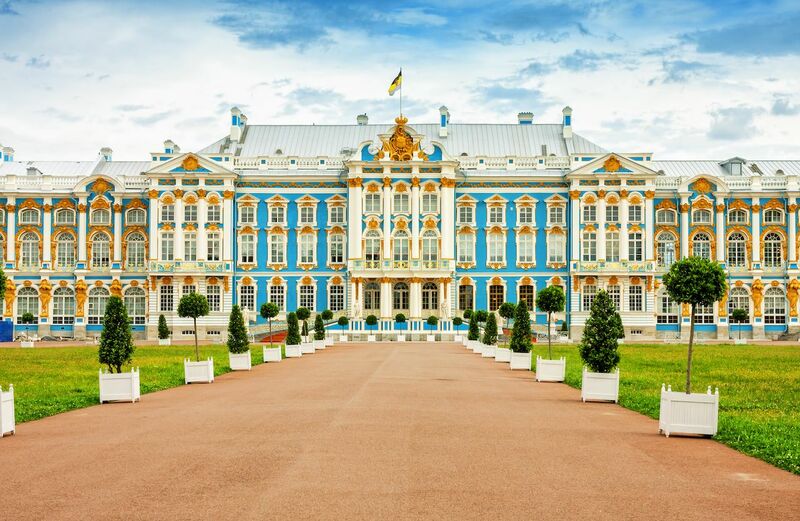 Originally owned by Alexander Menshikov, who rose to notoriety as a member of the court of Peter the Great and later became the first governor of St. Petersburg, the stone Menshikov Palace is one of the oldest buildings in St. Petersburg. It is now part of the Hermitage Museum — but always housed great art, as Menshikov himself was a collector. When Menshikov was overthrown and exiled to Siberia in 1727, the palace became a prestigious high school for Russian statesmen and military leaders. 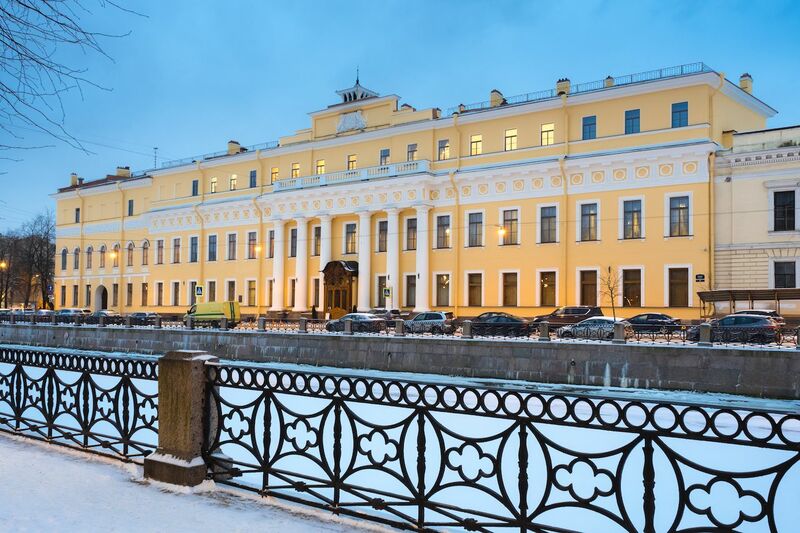 Menshikov Palace, located in St. Petersburg, is open to visitors daily and offers free admission to all visitors on the first Thursday of the month. 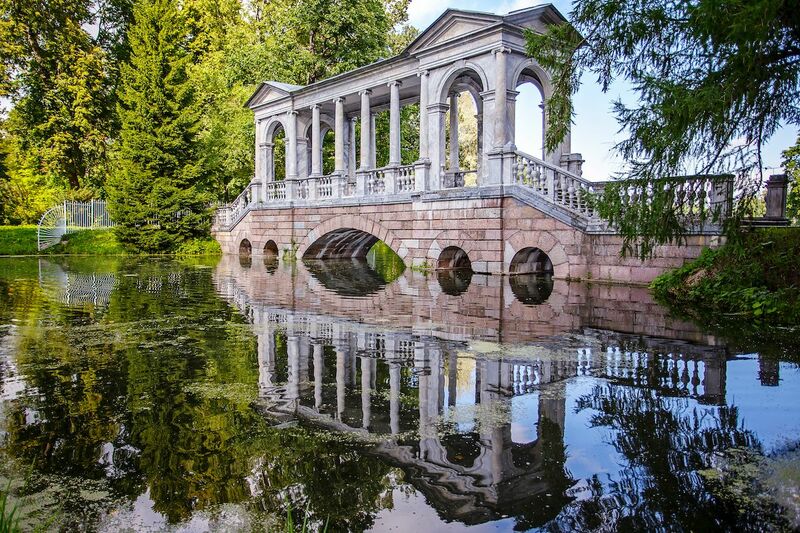 Rather than sumptuous decorations, the Pavlovsk Palace in St. Petersburg stuns in its elegance and perfect proportions; the architect, Charles Cameron, admired the austerity of classical design and reflected this in his work. 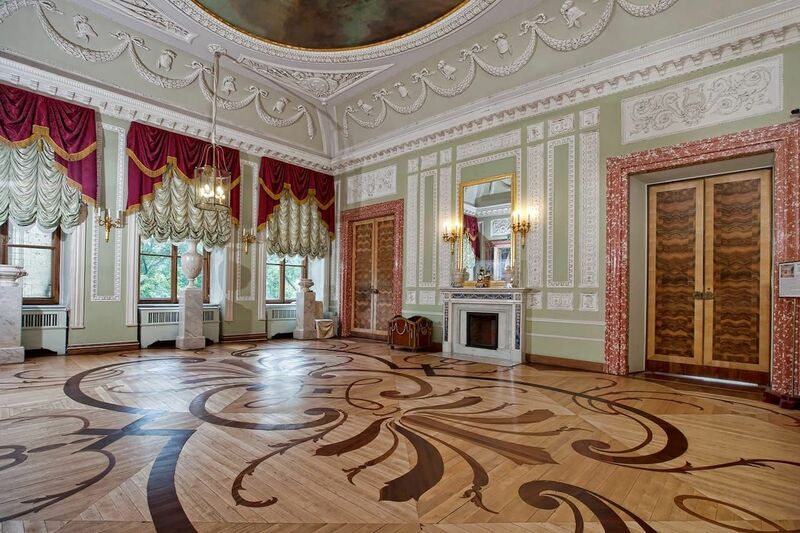 The interior, however, is a bit more ornate, with elegant furnishings fit for Russian royalty. Emperor Paul I added on to the palace when he ascended to the throne in 1796. Later, the palace was pillaged by Nazis during wartime, and it took a great many years for reconstruction work to restore the structure to its former glory. Today, Pavlovsk Palace is open to visitors all but one day per week (opening days change depending on the season) and costs about $8 (500 rubles) per adult. It’s located south of St. Petersburg proper, in the town of Pavlovsk, a one-hour train ride from Vibetski railway station. 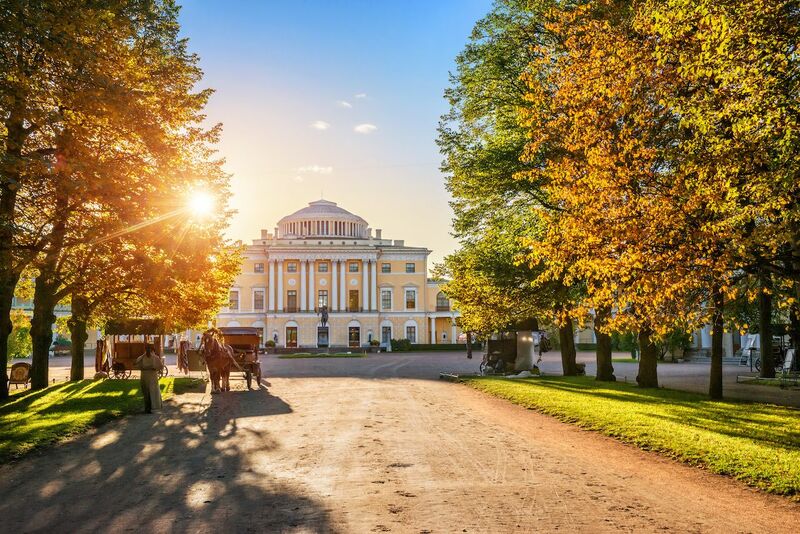 Located in Gatchina, a town located one hour away by train from the center of St. Petersburg, Gatchina Palace is now called the Gatchina Palace and Estate Museum, with rooms, exhibitions, and even an underground passageway available for visitors to explore (open daily). It has been home to four tsars in its lifetime. The palace opened to the public in 1918, soon after the Russian Revolution, but was badly damaged during World War II, and restoration work did not commence for decades afterward. Today, however, the museum hosts yearly exhibitions organized with other museums in Russia.